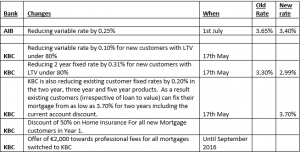 Today there were announcements from AIB and KBC that they would cut mortgage rates on several of their mortgage products . 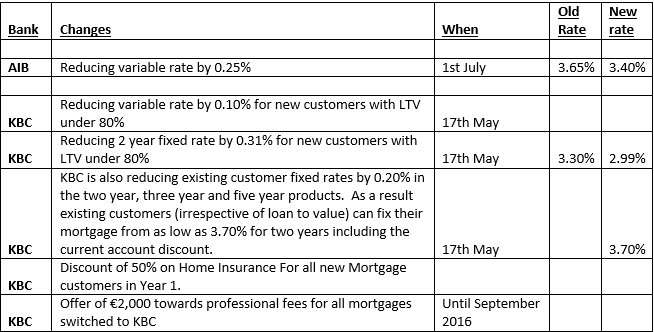 AIB announced that it would lower its variable rate by 0.25% at the beginning of Q3 and KBC also announced several cuts to its products – see the attached picture for a summary of the cuts. Buying a first property is the biggest financial decision that a lot of people make and can have a huge impact on your financial well being both now and for many years into the future. Putting in some spadework now will save you a lot of hassle in the future. Find out as much as possible about the areas you are looking at. Use online resources such as daft.ie and google maps to do some preliminary research. Also google the area to see if there are any future developments planned in the area that you should know about. One useful website is propertypriceregister.ie that contains details of all properties sold since 2010 – if you know how to use excel you can even download a spreadsheet to do some useful pivot tables to chart the movement of house prices since 2010 in the areas your researching. Anything can happen in life so it is important to consider the worst case scenario when buying a property. Compare your monthly mortgage repayments to the current monthly rents that similar properties in the area are commanding – is there any margin of safety? If rents were to fall and interest rates rise would there still be a margin of safety? This is important to consider as you may need to move in the future but the value of the property may have fallen. By having a margin of safety between the possible rent and the mortgage repayments it will allow you to avoid selling when the property market has crashed. Also it will allow you to cover any extra costs such as tax and repairs that come with becoming a landlord. Is there room to expand the property in the future? This is an important consideration if you are planning on having a family in the future. What is the BER rating? If it is low make sure you build the costs of upgrading the BER into your costs.